Iran will see an economic rebound. Iran will also have access to more than $100bn (£70bn) of money that was frozen overseas. However, it can only spend about $30-50bn, as the rest is thought to be been locked into previous commitments. The money may be used to import goods and services to renovate and modernise many of Iran's economic sectors. Already, Tehran is in talks to buy Airbus passenger aircraft by the dozens. 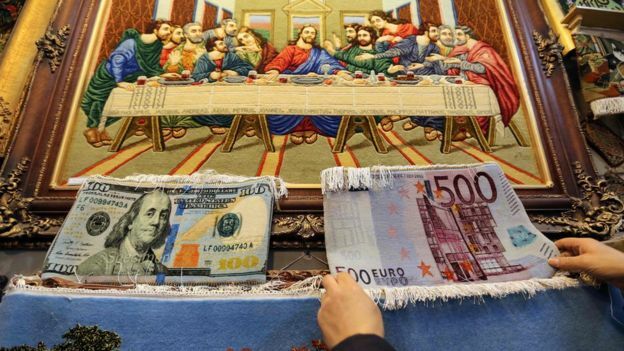 The lifting of banking sanctions also means Iran is reconnected to the world financial network. "We will also get some 300 Iranian individuals and companies off the (EU) sanctions list. Up to now, we couldn't do a single business transaction with them, not even selling bread or biscuits." With the lifting of sanctions Iran will be able to export as much crude oil to the world as it can, or as much as it can find demand for. Before imposing an oil embargo on Iran in 2012, one in every five barrels of Iranian crude went to European refineries. Iran has been selling just over one million barrels a day for the past few years, mostly to China, India, Japan and South Korea. Tehran says it will hike sales by 500,000 barrels the day after sanctions are lifted and increase total exports to around 2.5 million barrels within the next year. This will push the price in only one direction: downwards. The market is already flooded by cheap oil and there will be many more barrels in the market than there are buyers. In order to win back its customers, Iran plans to offer discounts on prices that are already the lowest in 11 years. Iran's full return to the market could trigger a price war with its arch-rival Saudi Arabia, which is trying to keep its own market share by selling under the market price. But the biggest bottleneck in future business with Iran could be banks. Although Iran will again be connected to the global financial system it is unclear how many banks will re-engage in Iranian business. There are currently very few countries in the world with Iran’s conditions and opportunities for investment. After decades of sanctions and separation from international markets, Iran is now ready to take advantage of these opportunities. Persian, or Farsi as it is called by those who speak it, is a language spoken in Iran, Tajikistan, Afghanistan, parts of Georgia, India and Pakistan. The language has developed much in the last few centuries. A great many words have also been loaned from geographically neighbouring languages; firstly from Armenian and Greek, but subsequently from Arabic and to some extent Turkish. In recent years, a lot of western words have been loaned, mainly from English and French. Official language of: Iran, Qatar.